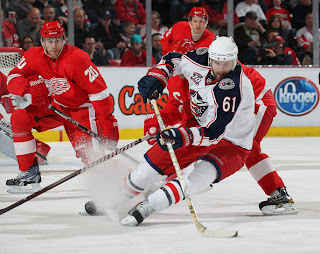 The Columbus Blue Jackets are the NHL's only remaining team without a win in the 2011-2012 season. The Detroit Red Wings will look to keep a zero in the Blue Jackets' win column tonight, when the Jackets travel to Detroit. The two teams are off to two very different starts to their respective seasons. Detroit (4-0-0) is off to its best start since '97-'98 while Columbus (0-5-1) is stuck in the middle of the worst start in franchise history. If the Jackets hope to win they have to correct one major fault, offense. Over the course of the teams first six games they have only scored twice in each of their contests. Making things more difficult, the Jackets will have to do so without off-season acquisition, Jeff Carter, who was placed on the injured reserve list due to a hairline fracture in his right foot. Team captain, Rick Nash, will once again be heavily relied upon to provide his team with some much needed offense. However, Nash, who has two goals and four assists this season, has struggled against Detroit, with one goal and three assists, in the team's last ten meetings. Steve Mason will be in net for the Jackets, as he has been for every game this season. Mason comes into the contest with 3.35 goals against average. Mason will have a big test against a Detroit offense that has scored 13 goals in just four games played. At the other end of the ice, Red Wing's goaltender, Jimmy Howard, will look to continue his strong start where he has gone 3-0, including one shutout victory, allowing only five goals. Jiri Hudler and Johan Franzen, who lead the team with four points a piece, account for four of the teams 13 goals this season and look to extend personal point streaks tonight against the Jackets. Outside of the top two, eight other players, including Pavel Datsyuk and Henrik Zetterburg, have found the back of the net.